The yellow flowering oxalis is a very common plant in our location here among the trees. It seems to prefer areas of moisture and shade. You can find it in lawns, gardens, waste places, fields, roadsides and open woodlands. Oxalis herbs are also referred to as Wood Sorrels. The wood sorrels are marked by clover-like leaves in threes with each leaflet being heart-shaped. 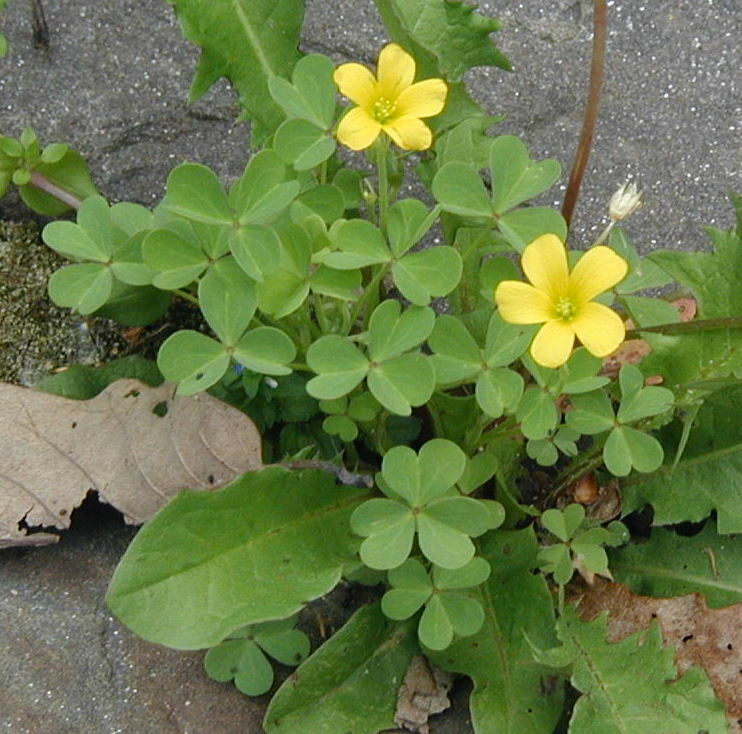 Yellow Wood Sorrel, Oxalis europaea, is an introduced species here in Pennsylvania and it’s native to Europe. There is also a pink flowering species, called Violet Wood Sorrel, Oxalis violacea, that I have not seen growing wild in our area of Pennsylvania. Small yellow oxalis came up through cracks between flagstones. Never mind the dandelion in the background. Leaves are light green to maroon. When the plant has maroon leaves it makes the yellow blossoms really stand out. Wood sorrel flowers have five petals and ten stamens and measure about a half-inch across. Oxalis flowers and leaves close up in the evening and re-open in the sunlight. Cloudy days will keep many Oxalis plants from opening their flowers at all. I’m a 90s kid. Back in my day growing up in SoCal, we had sour grass everywhere. One of my friends introduced me, and I was skeptical the first timed, but we instantly became addicted lol. We carried water bottles for the sole purpose of washing them after picking them. It was always funny seeing peoples reaction to something they didnt know about. We cleaned out neighbors lawns on our way to school and had to wait til it grew back. Cant wait to show my kids. Best line: “Can’t wait to show my kids” — I love you, Jorge!